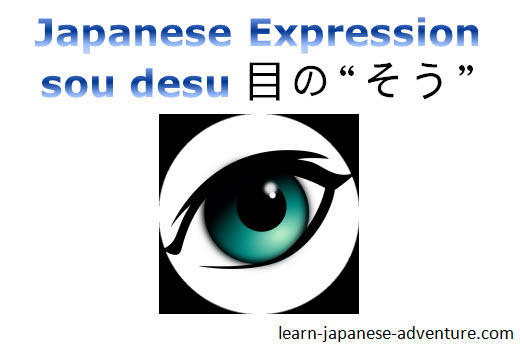 In this lesson, you are going to learn another Japanese expression そうです (sou desu), also known as 目の"そう" (me no "sou"). This is different from the other expression sou desu, or known as 耳の"そう" (mimi no "sou") you have learned in lesson 10. Difference between 耳の"そう" and 目の"そう"
そうです (sou desu) in 耳の"そう" (mimi no "sou") is used to convey the message that you obtained from another information source, either you have heard from someone or you have read it somewhere. Whereas for そうです (sou desu) in 目の"そう" (me no "sou"), it means "It looks like ~"or "It seems ~". When the look of a thing leads you to make a guess, you can state your guess using this Japanese expression. You make the guess after looking at the appearance of a thing although it has not confirmed for a fact. The "thing" here can also be a person, a place, a scene, etc. Note: this そうです cannot be used with a noun. I will discuss about そうです with verbs later. For now, let's concentrate on the そうです with adjectives. For example, you saw a fat lady walking across the street. She looks like a kind person judging from her appearance. How do you describe her using the above sentence patterns? Meaning: That lady looks like a kind person. You don't know about that fat lady and you are just describing her from her appearance. Therefore you can use this Japanese expression sou desu to describe her. Meaning: That lady is a kind person. How about her body size? In this case, you cannot say something like ふとっていそうです (futottei sou desu) which means she looks fat literally. Why? Because she is (obviously) fat from her appearance. That's a fact, not a guess. Therefore you cannot use the Japanese expression sou desu sentence pattern here. For example, a new teacher came to your school today. She looks very fierce from her appearance. How do you use the Japanese expression sou desu to describe the new teacher? Meaning: The new teacher looks like an unkind (strict) person. Assuming that you are looking at the news on the television. The news shows that Hokkaido is currently covered with heavy snow. It looks really cold there. On the other hand, the news also shows that people are swimming at the beach under the hot sun at Okinawa. It looks very hot there. How do you describe these two scenes? Meaning: It seems cold in Hokkaido. Meaning: It seems hot in Okinawa. Unless you have been to the two places personally and know the weather there, you can only use Japanese expression sou desu sentence pattern. Assuming that you are looking at the pictures of 2 different towns. Town A looks very quiet and Town B looks very crowded and lively. How do you describe them? Meaning: Town A looks like a quiet town. Meaning: Town B looks like a lively town. There are 2 exceptions where いい has to change to よさそうです and ない has to change to なさそうです. 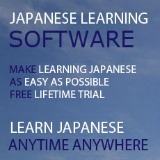 You have seen in the earlier examples on how to use なさそうです (nasa sou desu). Let's see some examples using よさそうです (yosa sou desu). Assuming that you have looked at the cover of a book and read some description on the cover. It looks like a good book. How do you describe it? Meaning: This looks like a good book. Assuming that you are looking at a guy who looks very smart from his appearance and the way he is talking. How do you describe him? Meaning: That person looks like a smart guy. However, in Japanese, when come to describing other person's emotional feelings, you definitely have to describe using the Japanese expression sou desu. The reason is that you can never know how the other person feels, even if the person tells you how he/she feels (he/she may be lying to you). You can only guess judging from his/her expression. Be careful not to confuse the meaning of 彼はつまらなそうです (kare wa tsumarana sou desu) and the meaning of 彼はつまらないです (kare wa tsumaranai desu). The former means that you are guessing that he feels bored by looking at his expression. The latter means that he is a boring person. 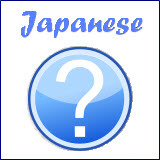 Moreover, つまらない (tsumaranai) is an い-adj (i-adj), not a ない-form of a verb. Therefore you cannot say something like 彼はつまらなさそうです (kare wa tsumaranasa sou desu). Meaning: It looks like it's going to rain soon. What if there is no cloud in the sky and is sunny. There is no sign of raining. How do you guess the weather? Meaning: It looks like it's not going to rain. Meaning: It looks like the rain is going to stop. Meaning: It looks like the rain is not going to stop. Meaning: It looks like that luggage is going to fall down. Meaning: It looks like the strap of my bag is going to break off. Meaning: It looks like the shampoo is going to run out. Meaning: It looks like the cherry trees are going to be in bloom soon. Meaning: It seems like it will be getting colder from now on. In summary, this Japanese expression そうです (sou desu) can be used if you are making a guess from the appearance of the "thing" you are describing. But if you have already known it to be a fact, it cannot be used. 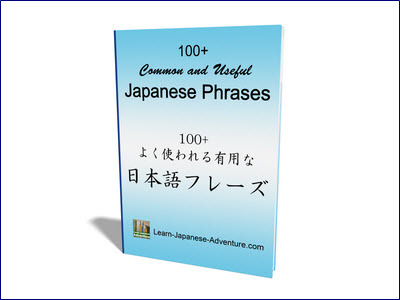 Lesson 10: Expression for Hearsay 耳の"そう".